Restaurant weeks are looked at as a great time of year to indulge on fine dining without breaking the bank. There’s a secret that you may want to know that can help you save not only on your meal, but also on getting you to the restaurant. 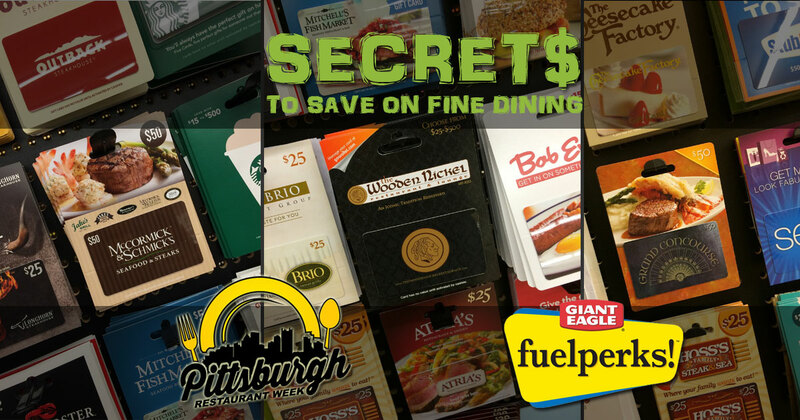 Several Pittsburgh-area restaurants have gift cards available at Giant Eagle. At this festive time of year before Christmas, Giant Eagle offers double fuel perks for every $50 purchased in gift cards. On a recent visit to an area store, great fine dining spots like The Wooden Nickel, McCormick & Schmick’s and Grand Concourse, all had gift cards available for purchase. Availability is based on the store. Details on Giant Eagle Gift Cards can be found on their website. With the next installment of Pittsburgh Restaurant Week coming up January 12-18, 2015, it’s a great time of year to load up on gift cards and fuel perks. Use that fuel and the gift card to indulge in the special menus offered all week long. CAUTION: Discount offers from sites like Groupon and LivingSocial often stipulate that they can not be used for fixed price meals. Check the fine print if you plan on purchasing to use during Restaurant Week.